In continuing with my real food way of living I wanted to share with you two of my favorite recipes! I hate to say none of them are my own either! This was my dinner tonight and it was fabulous! Nutrient dense so extremely filling! If it wasn't so late I'd add reasons, research and data to explain why I use different ingredients, for instance grapeseed oil over canola (throw the canola out!) but alas I am still recovering and should be in bed right now. It's been a busy day so I'll post a pic and the recipes. And please pardon the cut burger, I had to make sure it was done and did so before taking a snapshot. If you make these please let me know and be sure to visit the blogs associated with each! Enjoy! Place ground turkey in a bowl and mix with Bragg's and seasoning. Form into patties. Heat the oil in a skillet over medium heat and cook burgers until done. About 4 - 5 minutes on each side (depending on thickness). 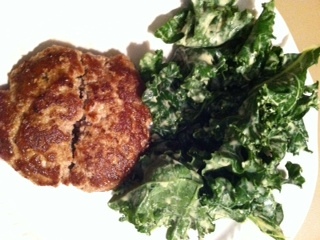 Serve burgers over Kale salad. OR top with sliced avocado and roasted red peppers.